Welcome to the new year, my friends and fellow gamers! Here at Green Ronin we have been rousing ourselves from our holiday torpor and getting ramped up for 2017. As long time fans know, I traditionally write a message in January to discuss what we have coming up in the new year. And that is true but I’m going to do it a little differently this year. Today I will talk about what we have coming your way through the Spring, then in June I will do a second one of these that covers the rest of the year. So let’s get to it! In December Crystal Frasier came onboard as our new Mutants & Masterminds developer. She introduced herself in a previous Ronin Round Table, which you can read here if you’d like to learn more about her. We are confident that Mutants & Masterminds is in great hands with Crystal. Today I’d like to welcome another new Ronin to the ranks: Malcolm Sheppard. He is a 17 year veteran of the game industry who has done a boatload of work for White Wolf and Onyx Path, amongst others. Malcolm will be doing design and development work for us on a variety of lines. You can think of him as a sort of developer-at-large. He’ll be working on Adventure Game Engine (AGE) games for sure, as well as some other projects you’ll hear more about later. Please help me welcome Malcolm to Team Ronin! 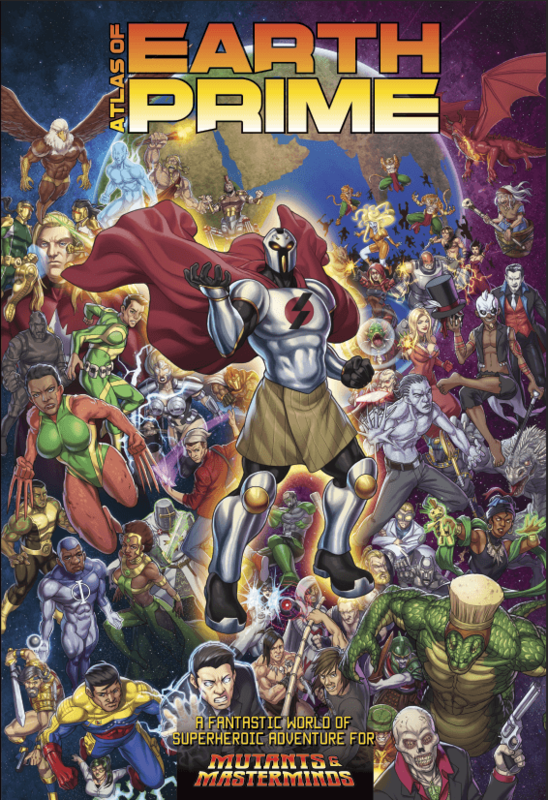 We are kicking off the year with a major release for Mutants & Masterminds: the Atlas of Earth-Prime. You’ve seen parts of this setting before in Emerald City, the Cosmic Handbook, Hero High, and many other Mutants & Masterminds books, but now Earth-Prime is getting full campaign setting treatment. The Atlas of Earth-Prime releases in just two weeks. You can still get in on the pre-order now if you are quick about it. In the Spring we’ll be following that up with Freedom City. This was the original campaign setting for the Mutants & Masterminds RPG going back to 2003. 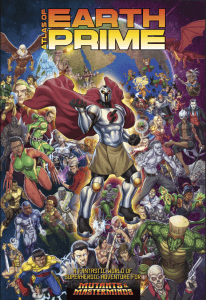 The new book brings Freedom City fully into Third Edition, and creates a triumvirate of super power with Emerald City and the Atlas of Earth-Prime! 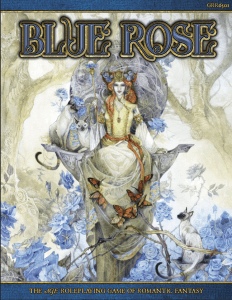 The big Adventure Game Engine excitement for the first half of the year is the release of Blue Rose, our RPG of Romantic Fantasy, in February. Blue Rose was our most successful Kickstarter to date, and we’re delighted to get this book out to backers and then released to the general public. The BackerKit went live over the weekend. While we typically do pre-orders through our online store, with Blue Rose we’re trying out BackerKit for that. If you didn’t back the Kickstarter, you can pre-order now at this link . You’ll note some follow up releases on the BackerKit page. We’re making Blue Rose dice with Q Workshop, Blue Rose conviction Tokens with Campaign Coins, and then an adventure anthology called Six of Swords. Those should all come out in the Spring. For Fantasy AGE itself we’ve got Titansgrave: The World of Valkana coming in the Spring. This is a full campaign setting book that greatly expands the information in Titansgrave: Ashes of Valkana. A lot of stuff that was only hinted at in the show will be revealed in Titansgrave: The World of Valkana! In other Fantasy AGE news, we’ll be creating a community content program for the game in conjunction with OneBookShelf (the parent company of RPGNow and DriveThruRPG). People have been asking us if they can publish Fantasy AGE content since the game came out and soon that will be possible. OneBookShelf already runs several of these programs, for games like D&D and the Cypher System. Ours will be similar to these but not identical. For starters the products you can do will be limited to settings and adventures because that is the support Fantasy AGE needs most right now. There will be more info about the program and how it all works when we launch it. That should happen in a couple of months. 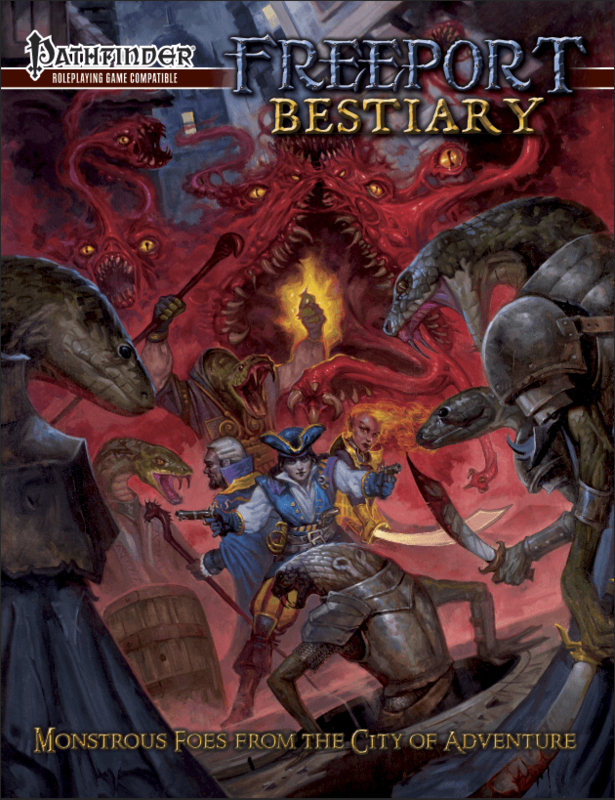 Our big Pathfinder release this Spring is the Freeport Bestiary. The City of Adventure hasn’t had a monster book since Creatures of Freeport in 2004. 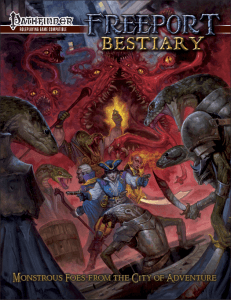 The Freeport Bestiary brings together the setting’s many monsters and a bunch of new ones in a beautiful full color hardback. Meanwhile, the Return to Freeport adventure series continues. We’ve released three of these PDFs so far. The remaining three will follow over the next few months and then we’ll collect them all together for a printed book in June. You may recall that we worked with Wizards of the Coast to create two D&D books: Out of the Abyss and the Sword Coast Adventurer’s Guide. Now we’re following those up with D&D books of our own. The first is Book of the Righteous, which presents a fully detailed mythology and pantheon you can use in your campaigns. The original edition of Book of the Righteous was our most critically-acclaimed book in the d20 era. We did a Kickstarter for a new 5E version last year and it should be out in May. As with Blue Rose, Book of the Righteous will have a general release after books ship to Kickstarter backers. I’m going to make an exception and discuss one Summer release because I know I’d get pilloried if I didn’t mention it. Of course I’m talking about Critical Role! We had originally intended to release this in the Spring but we’ve scheduled it for Gen Con instead. This is Gen Con’s 50th anniversary (and my 28th Gen Con!). We wanted a big marquee release for the show and the Critical Role: Tal’Dorei Campaign Setting book is a perfect fit. We want to make this a real event and hope to have the cast out to Gen Con again. 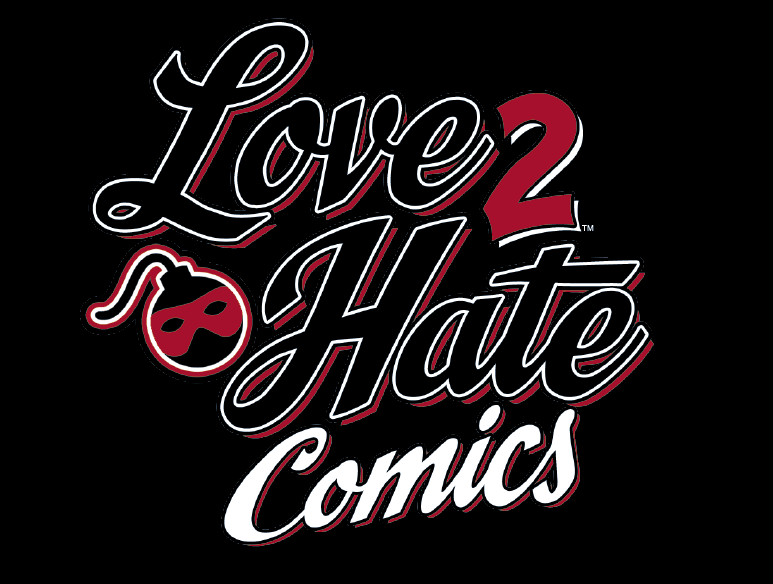 Towards the end of last year we released Love 2 Hate: Politics, the first expansion for the game. 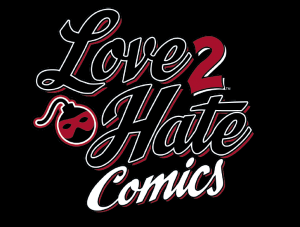 We are following that up in April with Love 2 Hate: Comics. Both expansions have 108 cards. You can mix them in with the core game, or play with them on their own for a more themed experience. We have Dragon Age and A Song of Ice and Fire Roleplaying books in development but licensed game lines require approvals and how long those take can vary quite a bit. It could be one week or three months depending. So don’t worry, books are coming. We’ve just decided to wait until everything is approved before we make formal announcements about their release. We have a variety of PDF releases planned to support our various lines. We have more Fantasy AGE Encounters and short Titansgrave adventures coming for Fantasy AGE, as well as the Short Cuts series for Pathfinder. We’ll also be continuing our series of Chronicle System PDFs, which provide non-canon rules support for A Song of Ice and Fire Roleplaying. In the past year we’ve released rules for magic (Chronicle of Sorcery) and gunpowder/firearms (Spark to Powder), for example. As a company Gen Con is, of course, our biggest show. Last year we had a room dedicated to Green Ronin games for the whole convention and that was great. We’re doing it again this year, so if you’d like to run games for us please contact Donna. If you run enough games, we’ll cover your badge and even subsidize your hotel room. Donna and Barry also run OrcaCon in Everett, WA (just north of Seattle). OrcaCon is happening this coming weekend, so come on out if you’re in the area. It’s the unofficial Green Ronin convention and most of our staff will be there. We’ve got folks running games and giving seminars, though personally I just want to play some games this year! Green Ronin is once again a sponsor of the JoCo Cruise and Nicole and I will be on onboard. Haven’t heard of the JoCo Cruise? Well, imagine a convention on a ship and you’ve got a pretty good idea, except it also includes music, comedy, and more. If it’s nerdy, it’s probably happening on the ship! There are still cabins available (the cruise is in March) and this year we have the entire ship to ourselves. Should be a great time. We’ll also be attending various trade shows, like GTS, the Alliance Open House, and the ACD Gamesday. If you are a game retailer, come see us! So that’s what we have coming the first half of the year. We also have some exciting news to share in the coming months. We’ll be announcing soon a new card game we’re bringing to Kickstarter in April and a new campaign setting for D&D 5E. We’ve licensed a comic book for RPG treatment. We’ve also got another AGE game in development, as well as Ork, Second Edition. Following us on Twitter (we’re @GreenRoninPub) is probably the best way to keep up with our announcements or just bookmark our website. This is Green Ronin’s 17th year in business. Thank you for your continued support over the years. I started the company as a side project and it’s become so much more than that thanks to you. Come back in June when I reveal our Summer and Winter plans. Until then, game on! Two New PDFs: Rogues Gallery and Fantasy AGE Encounters GM for Green Ronin at Gen Con!